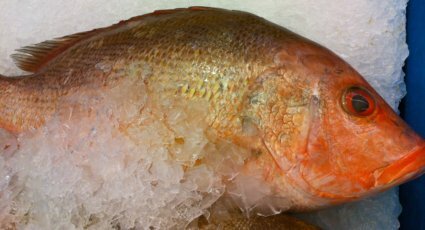 Red Snapper, red shy it is! So I am sure there are some of you out there who dont agree with my description of the Red Snapper being timid right? Well this Snapper variety does exist in many parts of the world. A tropical fish mostly so I am sure there is some sub variety (and as I said I wont go into Latin names, not just yet :P) that may be aggressive, but the ones I have had experience with are the variety found in South East Asia and these guys are timid at best. You would think that if a fish is called a Snapper that the behavior would be consistent throughout the family group. Strangely it is totally not the case and you can check out my Golden Snapper info to compare. The Red Snapper firstly is an elegant looking fish. Its red obviously but with parts that are pink and white. The larger they get, the redder they are and the more elegant they look. My experience with this fish is also at the local pay pond fishing haunt where they can be anywhere from 0.5kg to a few kg landed (again 1kg=2.2lbs). The Red, different from the Golden Snapper variety, is one that likes to 'hang out' at a particular spot. These fish dont seem to move much for whatever reason. They prefer hanging out by some sort of shelter so you will find them at, or close to things like piers. Sometimes, if you are lucky enough, and your tackle is near the pier, and it so happens that fish that get 're-filled' into the pond, are dumped right at your tackle, its quite likely you will catch a Red Snapper, if of course the fish being dumped is a Red Snapper. They are that immobile and maybe even slightly dumb (or maybe just too hungry). Most fish would probably swim far and away. So why do I call these guys timid? Well firstly the way they feed is more of a 'test and see' style. They will mess around with the bait, and if you are using a float, it may start bobbing a little bit. They dont tend to attack the bait and run with it or swallow it and run with it. They are more like 'hey man let me check this bait out, lets see if it tastes good, if it does maybe I will have some more'. At the same time, they tend to hang out together too. Most fish, school, I know, but if you do it 'quietly' enough, there is a good chance that you can keep casting your bait to the same spot and get a few Red Snappers consecutively! I am totally serious, I have seen it done and participated in the activity as a matter of fact, I think between 3 or 4 of us, we landed at least half a dozen in minutes. So how on earth do you reel in a timid or shy fish? The moment you see your float bobbing and its under a pier for e.g. likely its a Red Snapper checking out your bait, so just yank immediately. This is a difference to the Golden Snapper if you have read that yet. So yank it immediately and with some luck, you got yourself a nice Snapper. Dont leave it, cos he may have gotten your bait and you may not have gotten him. So that's the Red Snapper, takes a different way of fishing but once you got the idea, you are good to go. They seem to prefer shrimp, dead or alive but other times they will take other bait too. 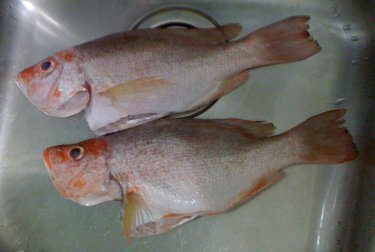 The Red, like the Golden Snapper, is a favorite aquaculture fish as well. Its not for the fish keeping enthusiast either as it grows to a few kg as well (double that for lbs). It does indeed have a strong, deep red color as the namesake. As it gets bigger, it looks nicer too. I would give this fish a 6 or 7 out of 10 on the FSI. Its easy to catch the fish if your bait happens to be where it is, cos it doesnt move much. It doesnt really fight that hard either, you can reel it in almost in a surrender state. Just because it does take some patience (and panic) to reel it in, that I gave it a middle type score. Good eats tho!